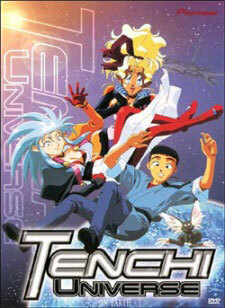 Watch Tenchi Universe Episode 22 English version online and free episodes. Anime Episode guide, Chapter Tenchi Universe Episode 22 English dubbed Sakuya’s Secret Ayeka and Sasami are shocked to realize that Sasami’s playmate Yugi and the evil force that attacked the Masaki shrine are one and the same. Whilst Sasami tries to come to terms with the truth about her friend, Ayeka lets paranoia get the better of her as she turns the house into a trap-filled anti-intruder zone! Meanwhile, Tenchi finds himself the unwilling subject of a photo session when Sakuya decides to take pictures of their summer break together, but his discomfort soon turns to unease when Sakuya evades even his most casual questions about her past. Could it be that Sakuya isn’t quite the normal high school girl she appears to be?